Teufel is set up quite differently from most of its rivals, with a range of loudspeakers that must be ordered off the Teufel website, rather than through traditional hi-fi dealers. This does mean making a purchase without the usual safety net, but then part of the deal is that you do get the opportunity of an extended trial period before committing yourself irrevocably. You also get an extended guarantee period – twelve years – and full phone/web-based technical support. Above all, the simplified retail structure means that more of the manufacturer's resources can be invested in R&D, so factor in unusually strong value for money. In fact, Teufel has not been afraid to break many of the mores of mainstream loudspeaker design. The Ultima 800, by far the most ambitious model that Teufel produces, is a three-way speaker, albeit one that uses no less than eight drive units: a tweeter, a midrange unit, two parallel connected bass drivers and four (count 'em!) passive bass units – three taking up the whole available baffle area on the back panel, as well as one pointing forward and mounted just below the two active drivers on the main front panel. There are a number of unusual and even unique elements to the design. The soft-dome tweeter has a larger diameter than usual, which suggests a more directional and a slightly less extended treble output, though this is addressed in part by being mounted alongside the midrange titanium dome unit on a sub baffle that is angled back and upwards by 30 degrees. The use of multiple passive LF drivers (aka ABRs – Auxiliary Bass Radiators) is an alternative to the more popular and much cheaper to implement, reflex port loading. With ABRs, there are no delayed reflections from inside the enclosure, and there is no air rushing through the port as the bass drivers pump. All this means less distortion and more consistent behaviour over a broader volume range. Passive 'flapping baffles' also add more variables to the enclosure tuning equation, namely the mass of the passive cones and the compliance of their suspensions. Other design highlights include a titanium-dome midrange unit plugging the gap between the bass array and the surprisingly low-tech soft-dome tweeter and the crossover which provides three additional bass alignment options, that are accessed by connecting a jumper between one or other of the three pairs of terminals in a row above the input. They provide settings with progressively leaner bass, the final one approximating to a sealed box alignment. In some acoustic settings, and depending also on personal preference, you may find one of these alternatives a better bet. In the flesh, the Ultima 800 is an absolute, unqualified knockout. Relatively compact and not excessively tall, given its flagship status and price, it is nevertheless heavy and solidly built as the rap knuckle test quickly confirms. The internal structure includes a separate sub-enclosure for the midrange dome and the main cabinet has an internal shelf brace about half-way up. Finally, the external presentation of the enclosure (walnut veneer on all visible surfaces, other than the front-facing baffles which are black), is first-rate, not least thanks to the high-grade, deep-gloss finish. The only real criticisms concern the midrange/tweeter cover, which does have a subtle audible influence on the sound, though it is readily removable and the wide footprint supporting superstructure, consisting of steel bars which are designed to be screwed to the underneath of the enclosure, and which are fitted with overhanging feet. 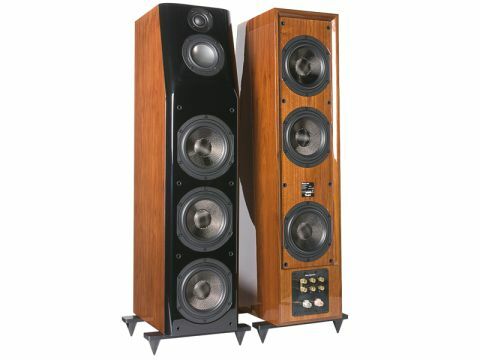 This arrangement, which is similar to that used, for example, by some Sonus Faber models, is perfectly functional, but it is not the optimum choice visually. The more common alternative of a wider overhanging wooden plinth could have provided similar levels of stability and a better visual fit in many surroundings. Teamed up with a Denon DCD-SA1 SACD player and PMA-SA1 amplifier, the Ultima 800 quickly establishes itself as a rock solid, stable and informative loudspeaker. You'll need to run it in for a few hours and choose the appropriate bass alignment from the four available, though we preferred the standard input (using just the normal input, with no shorting links). This native alignment is already verging on the dry sounding side of neutral, and on test in a large, well-furnished listening room, there is no perceived advantage in using any of the alternative settings. One recording that quickly demonstrated the Teufel's class was of Schoenberg's Gurrelieder, specifically the final movement Seht, die Sonne (see the sun), which is the massively powerful concluding section at the end of the oratorio, where density and passion is a hard job for many speakers to cope with at the elevated volume levels it demands. In a quite different recording, this time of Nikki Yanofsky Ella – of Thee I Swing (a young, pure voiced jazz singer), the Ultima 800 impresses for its purity and projection. With both recordings, the speakers are consistent in sound and retain a similar balance at even very high volume levels, while still offering a sense of projection at much lower volume settings, particularly during the Yanofsky recording. But, in both cases imagery is expansive, stable and airy. In conversation during the course of this review, Teufel made it clear that IT had paid particular attention to the issue of dynamic compression – one reason for the choice of a large diameter tweeter. Nevertheless, it is impossible to ignore that fact that the tonal balance of the speaker is inherently veering on the dry and light side of neutral. This is not uncommon with German speakers, but in any case it is quite subtle: the treble-led balance is in no way excessive and in our view should not be a deal-breaker. In many cases it can be addressed in the set-up, for example by choosing an alternative bass alignment as described earlier, or by adjusting the distance from the listener to the speaker so that the tweeter's main axis is not directly in line with the listener's ears. Whether or not you like the distinctive balance of the Ultima 800 is nothing more than a matter of taste, which for the most part is readily addressed with an appropriate choice of inputs and room positioning. Also be sure to remove the detachable cover over the midrange and tweeter – the covers over the bass units made no audible difference that we could detect. What is not in doubt is the Ultima 800's musical integrity. It goes loud, does dynamics and stereo imagery in a convincing and meaningful way and yet at low volume levels it still sings with considerable subtlety and poise. And being able to return them within the first eight weeks for a full refund is a real confidence booster, as well as helping negate the disadvantage of not being able to audition them at your local hi-fi store.